Spoiler: this beverage is exactly what it says on the tin. And that tin - er, box - is rather striking, isn't it? Cloves and lemon. Cinnamon and a little ginger? Orange peel. Smooth as all get-out. Very nice and, well, spicy. 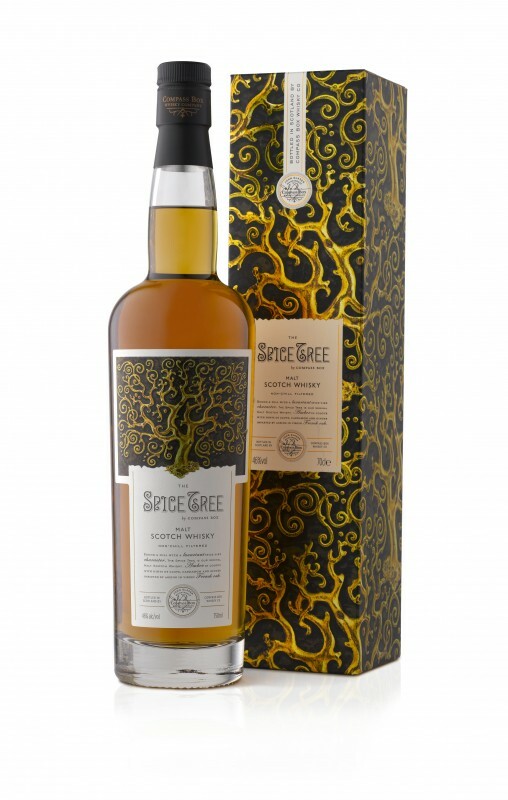 Compass Box's Hedonism made me a fan of these folks, and the Spice Tree only cements it. I will drink pretty much anything they put in a bottle. Don't test me, Compass Box. Right, this has gone on long enough. More tasting notes!! More Canadian goodness...hmm. Nail polish remover. Brown sugar and butterscotch. Seems a bit harsher than most Canadians (but, then, infant bunnies are a bit harsher than most Canadians, nyuk nyuk nyuk). Lightly fruity in the mouth, with a very short finish. Picked this one up a while back because I love Glenfiddich, I'd never seen it before, and the price was right. Apparently, it's a re-branding of the Glenfiddich 15yo Cask Strength, which I never had. Heavy on the sherry; vanilla and brown sugar abound. But dilute it with water (generally a good idea; it's cask strength, you realize) there's some trademark Glenfiddich pear lurking underneath. Fruity and warm. A little peppery? Yes. Opens up after a little time in the glass with some spice. A very pleasant drink, and not at all expensive for what it is. I'd put it right up there with the Macallan Cask Strength and the Aberlour a'bunadh. And with that, I realize I'm about done with heavily-sherried Scotches for a while. I love how they taste, but it can be so hard to get past the sweet syrupiness to get to the unique, interesting bits. And that's the part of tasting that I love the most. I think I'd rather have an interesting Scotch that doesn't particularly appeal to me than a delicious one that's just more sherry sherry sherry. Who knows...maybe I'm just burned out. I'll probably come around this autumn. Colder months just call for the warming quality sherried whiskey exhibits. The final JMR offering I've had the chance to try. There's still a fourth one out there, somewhere -- The Fresh Fruity One -- but it's either unavailable in the US, or unavailable period. The Smooth Sweeter One is as advertised, that's for sure. Sweet maltiness and thick honey on the nose, first. Soft marshmallow. It's thin in the mouth, but pleasant. The finish is light, easy -- all part of the smoothness, inviting you to take another sip. Don't be afraid; it won't bite. When I first tried it, I couldn't believe it was a vatted malt. I get flavors I usually only get from grain whisky, like coconut. I'm quite impressed at how these guys decide what they want, paint a bulls-eye on the target, and then just plain nail it. If you like your scotch sweet, JMR employs truth in advertising; this is your drink. I picked this one up on sale for considerably less than the $95 sticker price, and a bargain it was, too! Maple syrup (in both flavor and texture) and brown sugar. Vanilla in spades. Creamy, thick, and smooth. Warming and comfortable. Yeah, I know, that’s not much in the way of tasting notes…to be honest, there were no surprises here. If you’re at all familiar with Balvenie’s work, you’ll know exactly what to expect from a Balvenie called “Sherry Oak.” And it delivers. It’s a lovely drink, but I don’t know…heavily sherried Scotches are a dime a dozen, and there are several out there that are cheaper and no less satisfying. Another dram from JMR, and this one’s just as lovely as The Rich Spicy One was. Peat, obviously, and although I’m generally not fond of wood smoke in Scotch, the hint of it in this drink is not at all unpleasant. Very rich and malty, with a bit of pet store. …pet store?? Some spice and sweetness, nuttiness. And, no, there it is again: pet store. Not in a bad way, mind you, but it is certainly interesting! I'm a software developer and consummate geek, I live in Wrigleyville, and I enjoy long walks on the beach.